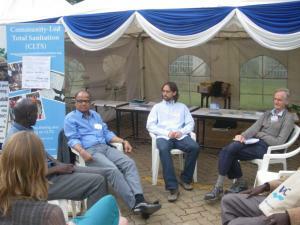 Our third day at the WEDC conference in Nakuru started with an open meeting at the CLTS stall. As those who participated were primarily from Kenya, most of the discussion dealt with sanitation in the country. The first topic discussed was the need of political commitment at higher levels if CLTS is to be rolled out at the country level. When it is in place, solutions are quickly found to the ‘common’ obstacles CLTS faces when scaling up (lack of capacity, human resources etc.). Another relevant issue raised was verification. Lack of external verification capacity is a key problem in Kenya, as only one organisation is entitled to do that. As a consequence, there is a long queue of villages waiting to be verified and its ODF status certified. This slows down public ODF celebrations of ODF which are an important ‘spreading strategy’... In addition, there have been some cases of verifications which were too strict, for example the ODF claim of a really successful village was rejected because one child was found to defecate outside the latrine. All the participants agreed that verification needs to be, as much as possible, a constructive learning experience for the community. Afterwards, we discussed the difficulty of reaching the least able –in Kenya and elsewhere– and ways to tackle it and encourage mutual help. In this respect, Kamal Kar shared a relatively recent addition he has made to the triggering process: After the ignition moment when the community has made the decision to stop open defecation, he asks the group which households won’t be able to build their latrine without help. Normally, some really poor families, old women or people with disabilities come forward. Then, the facilitator should ask for volunteers who commit to help them, and writes down the names of the households needing help and of those who will assist them. I also shared the idea, arising from my experience in India, that inclusion of all the sections of the community in the triggering and in the sanitation committee is crucial. A pre-requisite for achieving it is to gather information about the social fabric of the community during the pre-triggering. An alternative, inspired by an innovation from Ethiopia that can be used when there is a school at the community, is to motivate pupils to bring as many family members and relatives as they can to the triggering session, applauding those most successful. In the afternoon, we also had an interesting paper session which dealt with the issue of menstrual hygiene management (MHM). Menstruation is a taboo in almost every society, and it has been a blind spot in the sanitation sector. Fortunately, it is slowly getting more and more attention, as shows the fact that there were several papers about it in the sessions and side-events. Having adequate sanitation facilities is key for providing means and enough privacy for menstrual hygiene. This is valid for the household level, but even more critical at the school level. A presenter showed data from a survey in an area of Uganda: 46% reported not having adequate facilities in their schools for MHM and the share of adolescent girls missing school during periods was estimated to be 28%. A new development is that several national and sub-national governments are starting to (or planning to) distribute disposable sanitary pads, generally through schools (South Africa, Kenya...). However, these measures entail a risk in terms of the management of the pads once used, and these governments have apparently not planned for this. In urban areas, for instance, pads are one of the main contributors to blocks in toilets, pipes and sewers. There is an alternative, nevertheless: reusable cloth pads that you can wash and use again. 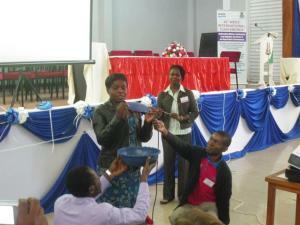 One presenter made a very illuminating demonstration on the process and another one shared insights from an interesting programme in Kenya, which combined hygienic facilities provision, distribution of reusable pads and a health education programme. Menstrual hygiene management in Nigeria among young adolescent is a challenge , Youth WASH Initiative has deemed it expedient to partner with major stakeholders in developeing a national Youth strtaegic plan and capacity building for young people.